NEW YORK — Let’s not kid ourselves here, Mike Babcock was saying. For the first time in Babcock’s tenure with the Leafs, there is something to figure out on the backend. For more than a year, the refrain has been that defence is the Leafs’ weakness. That the defence corps isn’t strong enough – or deep enough – to back Toronto to a run at the Stanley Cup. Suddenly, it seems the Leafs have a plethora of defencemen. 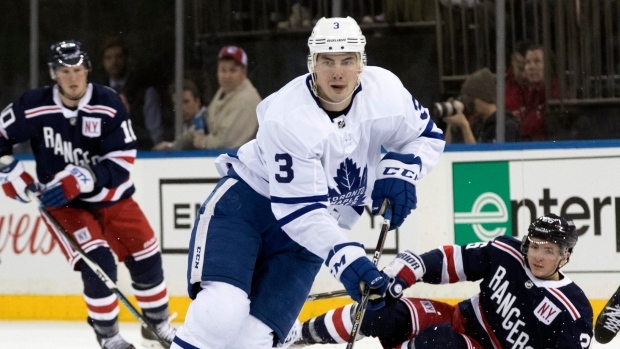 Thursday night’s 4-0 thrashing of the New York Rangers marked Toronto’s fourth straight win, with these last three against the Rangers, Islanders and Stars perhaps marking the Maple Leafs’ three best and most complete outings of the season. It has been, well, an eye-opener for Babcock. It’s almost hard to tell whether Babcock should be crowned a genius for finding this lineup combination with obvious chemistry and sticking with it – or chastised for not giving some of these young players an opportunity before now. Part of it has been dumb luck with Hainsey and Roman Polak missing games due to a stomach illness; Matt Martin sitting out was a coach’s decision. There was Holl on Thursday night playing like the right-shooting blueliner the Leafs have coveted. He became the first Maple Leafs defenceman to score in each of his first two NHL games. His teammates were calling him “Hollsy Orr” and “Justin Lidstrom” in good fun. Any night you can set an Original Six franchise record is a good night. So, no one is willing to anoint him a Holl of Famer just yet. After all, the last rookie defenceman to score in each of his first two NHL games was Alex Grant with Anaheim in 2013-14 and he didn’t play in the NHL again for two more seasons. He’s played five more games total. But it’s not unfair to say that Holl and Dermott are giving the Maple Leafs pause, as in: Maybe we have more here than we think. The Maple Leafs’ recent surge is not mutually exclusive to the young players that have filled in over the last handful of games. Between Kasperi Kapanen, Dermott and Holl, the injection of speed across Babcock’s lineup card has been noticeable. The Leafs just look like a different team with those guys playing. Dermott has already played himself into the conversation to stick once Polak et al are healthy again. Babcock called Kapanen an “NHL player.” And Holl has been one of the feel-good stories of the season, a player who said he may have given up on pro hockey if it meant another season in the ECHL. The sample size remains ridiculously small. But Babcock is interested in finding out more.